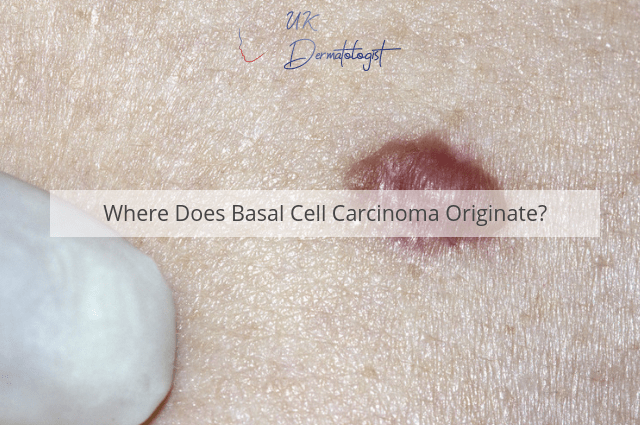 Basal cell carcinoma is one of the most common types of skin cancer and it normally occurs within areas of the skin that are exposed to excessive amounts of sunlight for long periods of time. The tumours present themselves as shiny bumps; particularly on the face, scalp and the bridge of the nose. The good news is that there are numerous basal cell carcinoma treatment options and if caught in its early stages, you will enjoy an excellent prognosis. So, where does this type of skin cancer originate and what mechanisms cause it to occur? Let’s take a look at the answers to both of these questions. The head and neck (85 per cent). The extremities and the trunk (15 per cent). It is quite rare for an individual to develop basal cell carcinoma in the pubic region. On a final note, it has been observed that higher incidences of basal cell carcinoma have been noted around embryonic fusion planes (areas of the face that first begin to develop while in the womb). This seems to support the theory that prenatal development can play a role in the acquisition of basal cell carcinoma later in life. Do you suspect that you might have this condition? If so, it is much better to be safe than sorry. Catching basal cell carcinoma at an early stage is key. This is why it is always a good idea to speak with a consultant at UK Dermatologist. We are fully capable of describing this skin condition in greater detail as well as providing you with a wealth of options to choose from. Previous PostPrevious What are the Common Risk Factors For Rhinophyma? Next PostNext Do I Have Rosacea or Seborrheic Dermatitis?